LAMPlatoon is an initiative by The LAMP (Learning About Multimedia Project) encouraging people to think critically about media they see every day. By unpacking the messages sent through advertisements, you are learning to navigate a world of media which can be overwhelming and confusing. LAMPlatoon is also an opportunity for you to exercise fair use, talk back to mass media, and hold media producers accountable for the ways in which their messages impact our lives. DUMBO has long been home to individuals and companies with equal parts creativity and business acumen. The combined density and diversity of the neighborhood, and New York City as a whole, allows us to tap into an abundant wealth of knowledge and industry – from Madison Avenue to Wall Street and the Tech Triangle to independent content creators all over our bustling city. Historically, 30 John Street has been home to creative types. Starting with Arbuckles Ariosa Coffee in the late 1800s, the building was originally home to a growing coffee factory. The Arbuckle Brothers, inventors in their own right, designed a machine that efficiently roasted, ground and packaged coffee for mass distribution. In later years, the space had subsequent incarnations as a whiskey storehouse for the Kinsey Distilling Company and a warehouse for A&S, Brooklyn’s leading department store. In the latter half of the twentieth century, the space was repurposed for offices and studios for creative professionals. As home of the Media Center, the space will return to its original function as a site for manufacturing—but this time around, the incubator at 30 John Street will brew stories and ideas. And instead of products leaving the doors via railway car or ship, these digital creations will be beamed around the world to be uploaded, downloaded, streamed—and perhaps even shown on a local screen near you. The Color Project at IFP Media Center from MPC Digital on Vimeo. When I was first introduced to computer programming, as a freshman in Electrical Engineering, Fortran and Pascal were the popular languages for newbies in computing and the Apple Macintosh was the new kid on the block. I remember being excited by the prospects, and looked forward to embarking on a rich and rewarding career after college. But I also recall, as I pursued my studies, feeling culturally isolated: few of my classmates looked like me. While we shared similar aspirations and many good times, there’s much to be said for making any challenging journey with people of the same cultural background. Much has changed since my college days, but there’s still a dearth of African-American women in science, technology, engineering and math professions, an absence that cannot be explained by, say, a lack of interest in these fields. Lack of access and lack of exposure to STEM topics are the likelier culprits. By launching Black Girls Code, I hope to provide young and pre-teen girls of color opportunities to learn in-demand skills in technology and computer programming at a time when they are naturally thinking about what they want to be when they grow up. That, really, is the Black Girls Code mission: to introduce programming and technology to a new generation of coders, coders who will become builders of technological innovation and of their own futures. Imagine the impact that these curious, creative minds could have on the world with the guidance and encouragement others take for granted. I have, and I can’t wait! 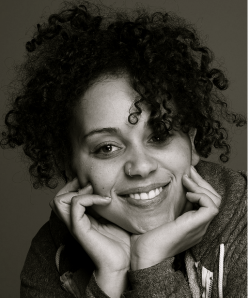 You can find out more about Black Girls Code on their blog. 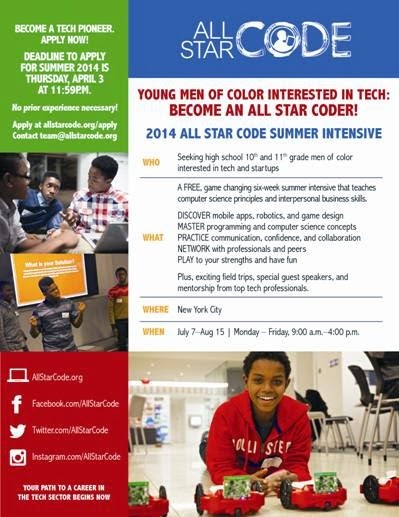 All Star Code is a non-profit initiative that prepares qualified minority boys for full-time employment in the technology industry by providing mentorship, industry exposure, and intensive training in computer science. ASC is dedicated to closing the opportunity gap between young men of color and the tech industry. Voces de Fillmore: Celebrating Stories from Los Sures from Voces de Fillmore on Vimeo. Voces de Fillmore is a film tracing the memories and experiences of families living on one block in Williamsburg, Brooklyn. The block, Fillmore Place, is a small street nestled in the Southside, or more affectionately known by long time residents as Los Sures. The Southside’s Latino population has steadily decreased from seventy to forty-five percent of the neighborhood. In the past decade, the population has gone from roughly 20,000 to 15,000 Latino residents. Voces de Fillmore is a first-person narrative of families who have lived and raised children in Los Sures for several decades and their quest to preserve a sense of community in a rapidly gentrifying neighborhood.